Wikipedia has been making a big push to cite published sources to support the content people have added online. This year, I have been adding a lot of new content to Wikipedia after finding published sources to cite. Unfortunately, sloppy citations and unsupported speculation are just as common in print as they are online. Here are three examples from my recent, rather intense research into aspects of architectural history relating to the National Register of Historic Places listings on Oahu. Punahou School's Pauahi Hall: architect(s) and date completed? Ripley's architectural partners were Dickey (1896-1900), Reynolds (1910-), and Davis (1913-). So the latest publication, with contributions by most of the major architects in Honolulu (Cheever 2003) seems the least reliable in this instance. Contributor Nate E. Smith, Associate AIA, was probably thinking of Ripley's work on the University of Hawai‘i's Hawaii Hall (1911), while Ripley was in partnership with Reynolds. Judge Henry E. Cooper House, Manoa Valley: architect(s) and date completed? Once again, the latest publication, with contributions by most of the major architects in Honolulu (Cheever 2003) seems the least reliable in this instance. Contributor Joseph J. Ferraro, AIA, was probably thinking of Traphagen's work on the Punahou School President's Home (1907). "Hardie Phillips" sourced in Honolulu: Gaspar 1996; Haines 2009; HawaiiHistory.org: Territorial Architecture - The Golden Age; Honolulu Star Bulletin, 1 September 1997, 28 September 2003; Localism: Territorial Style Elegance in Honolulu. Historic Buildings Tour 1.0; NRHP #80001272; Smith 1996:359; Wilcox 1972:22; www.nationalregisterofhistoricplaces.com. "Hardie Phillip" in Wikipedia and elsewhere: C. Brewer Building; Anna Rice Cooke; Bertram Goodhue; Honolulu Academy of Arts; Lihiwai; Mayers Murray & Phillip; Penkiunas 1990:145-182; Sakamoto 2008:34. Once again, the received wisdom of nearly every architect in Honolulu, and every published source based on that received wisdom, has perpetuated a minor error that every Wikipedian seems to have avoided. There is no "Hardie Phillips" in Wikipedia. Alexander, Mary C., and Charlotte P. Dodge (1941). Punahou, 1841-1941. University of California Press. Cheever, David (2003). Pōhaku: The Art & Architecture of Stonework in Hawai‘i. Editions Limited. Haines, Frank S., FAIA (2009). Exploring Downtown: A Walking Tour. Honolulu Chapter, American Institute of Architects. Neil, J. Meredith (1975). "The Architecture of C.W. Dickey in Hawai‘i." Hawaiian Journal of History 9:101-113. Sakamoto, Dean, ed. (2008). Hawaiian Modern: The Architecture of Vladimir Ossipoff. Yale University Press. Smith, George Everard Kidder (1996). Source Book of American Architecture. Princeton Architectural Press. Wilcox, Gaylord (1972). "Business and Buildings: Downtown Honolulu's Old Fashioned Block." Hawaiian Journal of History 6:3-27. Commerce grew to become a vibrant sector, primarily because Japan was located next to the most dynamic economy on earth: that of Sung China. Sung Chinese invented gunpowder, the compass, and mass printing. The country also had advanced carbon-stoked iron furnaces producing high-grade ferrous products and a cotton industry producing everything from ships' sails to military uniforms. The population grew by leaps and bounds during the Sung period, as the "rice bowl" of southern China was more intensively cultivated and regional craft and trade specialization took place as never before. Trade between China and Japan, exclusively for the archipelago's elite, was already underway in the tenth century. By the late eleventh and twelfth centuries huge Chinese junks called even more regularly at Hakata, Kamizaki, and other Kyushu ports. By 1100, a community of overseas Chinese took up residence in northern Kyushu cities such as Hakata. They held rank at the Japanese court and some even attended the funeral of an important official in northern Kyushu in 1097. In 1151, two samurai attacked the overseas Chinese there, and the fleeing merchant families numbered more than sixteen hundred. Archaeological evidence also points to a dramatic increase in commerce with China during the twelfth century, as the number of sites in Japan containing shards of Chinese porcelains grew exponentially. Besides Kyushu, Chinese traders also called on ports along the northwestern coast of Honshu. By 1180, some daring Japanese captains attempted the passage to southern China as well. Chinese merchants traded their silk, spices, and porcelain for northeastern Japan's furs and gold. The Chinese especially coveted gold; a Chinese trader wrote in 1118 "the country of Japan ... in its earth has a wealth of precious products." Perhaps for this reason, the dynamic Sung state, populated by wealthy consumers, ran a balance of trade deficit with Japan. Piles of Sung cash were soon helping to remonetize the Japanese economy. By 1150 there were signs that the outflow of Sung cash was causing the economic giant problems. In 1199, the Chinese government tried to ban the use of its coins in trade with Korea and Japan. A significant increase in the amount of Sung coins in Japanese sites took place beginning in the 1170s. People wrote of a "cash sickness" in 1179, and then the court banned the counterfeiting of Sung coppers. These proscriptions were apparently ineffective, because the court repeated them in 1187, 1189, and 1192. Along with the cash came an inflationary price spiral, beginning in the 1170s, helping to further destabilize an already teetering social pyramid. The Ise Taira built a trading empire in western Japan during their tenure as the military arm of the court from 1159 to 1180. They controlled bases such as Fukuhara in modern Kobe, Itsukushima along the Inland Sea, and Kamizaki in northern Kyushu. The Taira made allies of the seafaring families in western Japan. They were so involved in the Sung trade that in 1180 ex-emperor Takakura, born of a Taira mother, was induced by Kiyomori to sail from Fukuhara to Itsukushima aboard a Sung junk. In addition, the Koryŏ dynasty (918–1258) exchanged goods frequently with Japanese merchants. Following the collapse of the Silla kingdom, relations between the Japanese court and Korea improved. Between 1050 and 1090, Japanese merchants visited Korea in sixteen trade missions, bearing weapons, screens, and precious metals for the Koryŏ court. This strong external stimulus, combined with the modest demographic recovery, led to a rebound in Japanese domestic commerce between 1050 and 1180. As had occurred during the eighth century, the capital and Kinai constituted the core of commercial activity, because that region had a large number of consumers and the remnants of an advanced transportation system. Commerce was more dynamic in western Japan and probably less important in eastern Honshu. Long-distance exchange, however, enabled the elite to acquire the marvelous products of northern Japan, such as gold and wild horses. The elites also still received most commodities in kind from their on-site landlords and tax farmers, and peasants bought and sold at markets only occasionally, yet demographic and economic recovery supported and was assisted by the return of a more vital market system. Beginning in 1949, China responded to so-called Uyghur separatism and the quest for Eastern Turkestan (Xinjiang) independence as a domestic problem. Since the mid-1990s, however, when it became aware of the international aspects of this problem, Beijing has begun to pressure Turkey to limit its support for Uyghur activism. Aimed not only at cultural preservation but also at Eastern Turkestan independence, Uyghur activism remained unnoticed until the 1990s, despite the establishment in 1971 of Sino-Turkish diplomatic relations. It has gathered momentum as a result of China's post-Mao opening, the Soviet disintegration, increased Uyghur migration, the growing Western concern for human rights, and the widespread use of the Internet. Until the mid-1990s Turkey's leaders managed to defy Chinese pressure because they sympathized with the Uyghurs, were personally committed to their leader Isa Yusuf Alptekin, and hoped to restore Turkish influence in Central Asia. By late 1995, however, both that hope and Alptekin were dead, and China was becoming an influential, self-confident economic power. At this time Ankara chose to comply with Beijing's demands, which were backed by increased trade, growing military collaboration, and China's veiled threats of support for Kurdish nationalism. Consequently, Turkish Uyghurs suffered a serious blow, and some of their organizations had to relocate abroad, outside Beijing's reach. Nonetheless, Uyghur activism continues in Turkey and has become even more pronounced worldwide. Possibly less concerned about the Uyghur "threat" than it suggests, Beijing may simply be using the Uyghurs to intimidate and manipulate Turkey and other governments, primarily those in Central Asia. Anybody who's paid attention to my latest batch of Flickr photos will know that I took a short trip to Korea in June. Unfortunately, the rudimentary Korean I had learned before my last visit there on a wonderful junket in 1995 had faded to the point that I felt rather frustrated by my inability to say very much, despite my ability to read and sound out far more words in hangul than I can understand. However, I did manage to pick up a few new Korean words for things I ingested, plus one new Chinese expression that showed up repeatedly in the subtitles of an in-flight movie too silly to listen to. This time I learned the names for two new Korean teas, one of which I'm sure I sampled during my last visit back in 1995. 오미자차 omija cha (五味子茶) 'five flavor berry tea' is made from Schisandra chinensis (Ch. wǔ wèi zi, Jp. gomishi), whose flavor, as its common name implies, is supposed to be sweet, tart, salty, bitter, and aromatic all at once. I found it very refreshing. 솔잎차 'pine leaf (= needle) tea' (松葉茶) is written sol ip cha but is often romanized solnip cha and it sounded to me like sollip cha (and not sorip, as it would normally be with an /l/ between two vowels). This tea was was also refreshing, mildly aromatic, not sweet, and only slightly bitter. The native Korean root for 'pine' is sol- in 'pine needle' (솔잎 sol-ip) but is truncated to so- in 'pine tree' (소나무 sonamu). The Sino-Korean root is song-, as in 'pine flower/pollen' 송화 song-hwa and 'pine dumplings' song-pyeon (served at Chuseok). It is cognate with (Mandarin) Chinese sōng and Sino-Japanese shō (as in shōchikubai 'pine-bamboo-plum'). UPDATE: In a comment at my wordpress blog, Doc Rock clarifies something I suspected. Your juxtaposition of the Hangeul 솔잎차 followed the Chinese equivalent in Hancha (松葉茶) seems to imply that the characters are read 솔잎차 in Korean. They are not, they are read 송엽차 [song-yeopcha]. 솔 [sol] is the pure Korean for pine as in 솔나무, while 송[松] is the reading of the Sino-Korean loan word. What is confusing, perhaps, is that in the compound 솔잎차 the native Korean 솔잎 [pine leaf/needle] has the Sino-Korean loan word 차 [茶] appended to it. My only evidence for this distinction between native Korean and Sino-Korean readings for 'pine' was the gloss for 松 in my little Hanja dictionary: 솔송 [sol-song] in the usual Korean manner of combining native Korean plus Sino-Korean words for the same meaning. The paragraph above has been revised accordingly. 번데기 beondegi 'chrysalis, pupa' (borrowed into Jp. as ポンテギ pontegi) - In 1995, I got the chance to sample fried grasshoppers, thanks to a little old lady selling them by the parking lot at Sokkuram Grotto in Gyeongju. 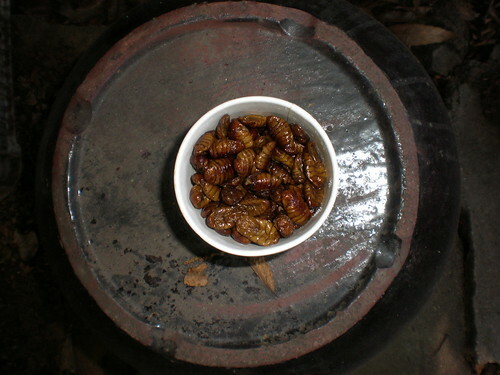 This year, I came across cooked silkworm pupae on sale by the footpath to Jeondeungsa temple complex on Ganghwa Island. I was surprised that several others in the group I was with sampled them. They're more chewy than crunchy, high in fat, fiber, and calcium, and not too salty. They used to be a very popular snack in Korea—for kids as well as adults. They were also eaten in China. Nowadays, they're much more commonly used to feed koi (carp), turtles, lizards, and chickens. Writing in The Atlantic, Robert Kaplan offers an awfully grim retrospective on how Sri Lanka won its 26-year war against the Tamil Tigers. Though it was only a one-day news story in the United States, a momentous event occurred last spring, with worldwide military significance. After 26 years of heavy fighting, the Sri Lankan government decisively defeated an ethnic insurgency, killing all of its top leadership, whose bodies were displayed on national television. Massive victory parades followed. The Tamil Tigers were no ordinary insurgency. Built on the ethnic hatred of the minority Hindu Tamils against the majority Sinhalese Buddhists, the movement was among the best organized and most ruthless to have emerged anywhere since the Second World War. The Tigers boasted their own air force and navy to go along with their unconventional ground troops. They helped pioneer the use of suicide bombers. (Recall that it was a female Tiger suicide bomber who killed Indian Prime Minister Rajiv Gandhi in 1991.) They regularly embedded their fighters among noncombatants, using them as human shields. In other words, they were as organized and heartless as any insurgent group in Iraq or Afghanistan. The war was won using techniques like the following, which the United States could and should never employ. The insurgents are using human shields? No problem. Just keep killing the innocent bystanders until you get to the fighters themselves.... The Sri Lankan military indiscriminately killed large numbers of civilians—as many as 20,000 in the final months of fighting, according to the United Nations. Bad media coverage is hurting morale and giving succor to the enemy? Just kill the journalists.... No journalist I met in Colombo was willing to cross the line and publicly attack the government. Kaplan adds a few other harsh observations in an interview with Michael J. Totten. In Sri Lanka you have a majority Sinhalese Buddhist population that thinks like a minority. They have a minority sense of oppression. Although they have 75 percent of the population while the Tamils have only about 18 percent, there are 60 million more Tamils nearby in southern India. So they’re kind of like the Iraqi Shias and the Serbs, other majorities who feel like minorities, and can be twice as brutal because of it. Japanese atrocities may have played some part in the refusal of Chiang's government to contemplate a negotiated peace after 1937, despite German efforts to broker a truce. Of more importance was probably the manifest inability of the Japanese to inflict a decisive defeat on Guomindang forces, despite the poor leadership, low morale and appalling under-equipment that afflicted the latter. * Although the Japanese armies continued to advance steadily westwards in the course of 1938, capturing Canton, Wuhan and Xuzhou, they suffered increasingly heavy casualties as their lines of communication became overextended. At Taierhchuang [sic] in March 1938, for example, the 10th Division found itself all but surrounded and ended up losing 16,000 men in days of intense house-to-house fighting. Eighteen months later the 11th Army was heavily defeated at Changsha (Hunan). The invasion of Guangxi at the end of 1939 was short-lived; by the end of the following year the Japanese had been forced to abandon Chinhsien, Nanning and Pinyang. By 1940 they had more or less reached their limits in China and the location of the front line did not significantly change again until 1944. The effect of all this was to strengthen the hand of the more extreme elements within the Japanese military, the so-called ‘Control Faction’, who advocated ignoring the existing Chinese authorities and dealing with puppet regimes, as they had done in Manchuria. Here, it might be thought, the Japanese had miscalculated. Who in China would want to lend his support to invaders capable of such terrible atrocities? As in other theatres of war, however, the key to securing collaboration turned out to have little, if anything, to do with the cruelty or kindness of the invading forces. The decisive factor was the extent to which the invaded people were divided among themselves. The Japanese invasion did not elicit national unity, as some Chinese Nationalists had hoped it might. It boosted support for the Communist Party, which under Mao Zedong's leadership now committed itself to a campaign of protracted guerrilla warfare. At the same time, Japanese incursions tended to widen divisions within the Guomindang. The more recruits the Communists were able to find among impoverished and disillusioned peasants, the more tempted some Nationalists were to compromise with the Japanese. The further Chiang retreated to the west – and he did not stop until he reached Chongqing in the province of Sichuan, 800 miles from his starting point, Nanking – the greater the incentive for those left behind to make their peace with the Japanese. Already by 1937 the Japanese had established three puppet regimes, in Chinese territory: the ‘Empire of Manchukuo’, the supposedly autonomous Mongolian regime of Prine Te [sic; = Prince Te(h), De Wang, Demchugdongrub/Dam-chukdangrub) and the East Hebei Autonomous Anti-Communist Council. By the middle of the following year, two more had been added: the Provisional Government of the Republic of China set up in Peiping by the North China Area Army, and the Reorganized Government of the Republic of China established in Nanking by the Central China Area Army. In March 1940 the Japanese pulled off a major diplomatic coup when they succeeded in persuading the former Nationalist leader Wang Jingwei to become the figurehead in charge of the latter. After renewed attempts to negotiate some kind of peace with Chiang had foundered, Wang's regime was officially recognized as the legitimate government of China. Wang himself had been duped; he had been led to expect concessions like a definite date for Japanese troop withdrawals and a unification of the various puppet regimes under his authority. He ended up having to recognize the independence of Manchukuo, to allow the indefinite stationing of Japanese troops in China and to accept joint control of the maritime customs and other tax agencies. This meant that by 1940 the Japanese and their puppets controlled virtually the entire Chinese coast and a large proportion of the country's eastern provinces. These were by far China's most prosperous regions. Wang alone was nominally in charge of half a million square miles of territory and around 200 million people. Many Chinese agreed with the economist T'ao His-sheng [sic; = T'ao Hsi-sheng, Tao Xisheng], a leading collaborator in Wang's regime: ‘China is a weak nation. In adopting a policy of being “friendly to distant countries and hostile to neighbours” [she] will inevitably bring about a situation which is summed up in the proverb: “Water from afar cannot extinguish a fire nearby.”’ Collaborationist slogans such as Tong Sheng Ghong Si [sic] (‘Live or Die Together’) were not wholly empty of meaning. *The fighting strength of the Chinese army was around 2.9 million, divided into 146 divisions and 44 independent brigades. However, each division had just 324 machine-guns between nine and a half thousand men. In all, the Chinese army had little more than one million rifles and just 800 pieces of artillery. Ferguson's handling of Chinese names and terms seems very sloppy. If the slogan he mentioned is 同生共死 (lit. ‘same live both die’), a closer rendering might be Tong sheng gong si ‘Live together, die together’.